Two new Mexican restaurants opening later this month in the same Clarendon, Virginia, building will feature a menu from celebrity Mexico City chef Gerardo Vazquez Lugo. Vazquez Lugo has partnered with Street Guys Hospitality on TTT Mexican Diner and Buena Vida, set to open at 2900 Wilson Blvd. on March 18, in the former La Tasca restaurant space. La Tasca closed a year ago. Vazquez Lugo heads Mexico City’s acclaimed Nicos restaurant, which opened in 1957. Vazquez took over the kitchen from his parents in 1995. Vazquez Lugo serves as long-term concept chef for both new restaurants, but is not a business partner. Nicos has been named among Latin America’s best restaurants, and received The 2019 Diners Club Lifetime Achievement Award for its contribution to Mexican cuisine. TTT Mexican Diner, the more casual of the two, will be on the first floor, serving authentic Mexican street food, with tacos and tortas as the main attraction. TTT will serve brunch, lunch and dinner daily. 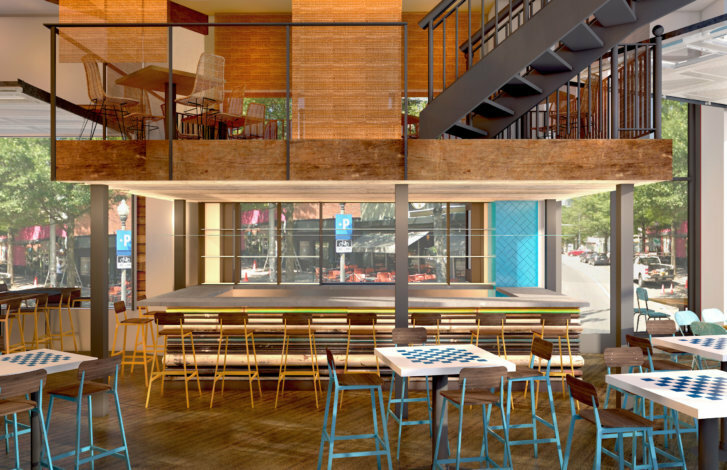 TTT includes seating for 86, plus 26 more on the mezzanine level and a 30-seat outdoor patio. Buena Vida, the more formal of the two restaurants, will be on the second floor, serving traditional Mexican fair, which Vazquez Lugo says will use recipes handed down through the generations. It has seating for 101, including an 18-seat private dining area and 11-seat bar. Prices at TTT range from $8 to $25. Menu prices at Buena Vida range from $5 to $30. Street Guys Hospitality opened Tacos, Tortas & Tequila (TTT) and another version of Buena Vida in Silver Spring last year. Vazquez Lugo is not currently involved in those kitchens.